Do you use videos to marketing your business? If not, you're almost certainly missing out, as video can show users so much more and help to close sales. It can also help increase user engagement and time spent on your website. And these, in turn, help to improve your search engine visibility. Video is BIG, and it's only getting bigger. Ready to have your video really pop? And I mean ... pop off the screen. This is entirely OPTIONAL, but if you want to include it, you'll see the "Enable 3D" button. Push that button in the video above and you'll see the video shift to a red / cyan color scheme. For those who have anaglyph 3D glasses, they will see your video in a whole new dimension. This won't be useful for every video, but in the right setting and to the right audience, this can be a huge wow factor. Think about someone shooting action videos while riding bikes, skiing, etc. Or think about showcasing a product. Keep reading and you'll see how many other useful marketing tools are built into this video player. If you prefer to use these while keeping a traditional 2D video, you can do that as well. At any point in the video, you can have a "Call to Action" pop up. Scroll the video above to nearly the end. At 60 seconds, it will pop up a "Buy" button for the book. Your CTA can pause the video behind it, or allow the video to keep playing. CTAs include things like "Buy" buttons and newsletter sign-up forms. So you can engage someone with video content, then let them know you're going to continue the video, but if they love what they're seeing, you're going to give them an option to follow you by e-mail. And then the form pops up. Or at the end of your video, you add the buy button or a coupon code to move them toward your product. With HTML CTAs, the possibilities are broad. Just provide me with an HTML code from a service you're using and we can integrate that! You've seen ads from sites you've recently visited. This is retargeting in action. With this feature, you can advertise on Facebook, AdRoll, etc., to those who have seen your 3D video. They'll probably remember the video because it was in 3D. So you can reference your video and then move them to the next step in your conversation and toward the close of a sale. Click in the upper right corner of the video above and you'll see two options. One of them is reviews. You can choose what reviews are placed into the player, highlighting the best comments about your products or services. Click in the upper right corner of the video above and the OTHER option is to get answers about the book. I've only set up one answer regarding its price. So go ahead, ask what the price is. You should get a detailed answer. You can set up many questions and answers to help people learn what they need to about whatever you're featuring in your video. I can also check on questions that have been asked so you can provide more answers over time. You can include social media icons connecting people to your social media accounts, embedded in the video. Maybe you want others to be able to embed your video on their sites. No problem -- just provide them with the same embed code I give you for your site. But what if you want to protect your video so you're the only one who can place it on your site? Just let me know and I will protect it by only white listing YOUR site. This way if others grab the embed code from your website code and place it on their site, the video will forward their visitors to your site ... where they belong. 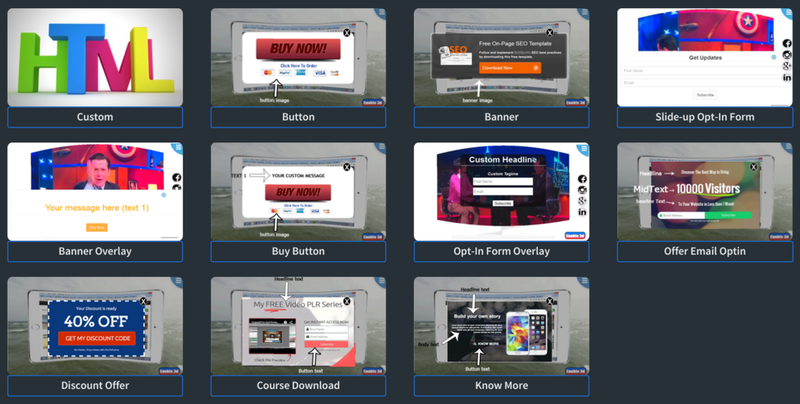 Want to promote your 3D video in e-mail or on social media? I can provide you with an animated GIF that can be used in both of these settings. Yes, they'll see animation inside their e-mail or on Facebook. Simply provide them with a link for watching the live video on your site!